We’ve been a bit off our game recently but should be back with more regular updates soon. In the meanwhile, we’d like to submit our first inductee into the Hall of Shame: an outfit unanimously reviled by the Final Fashionista staff and worth bookmarking for fashion posterity. 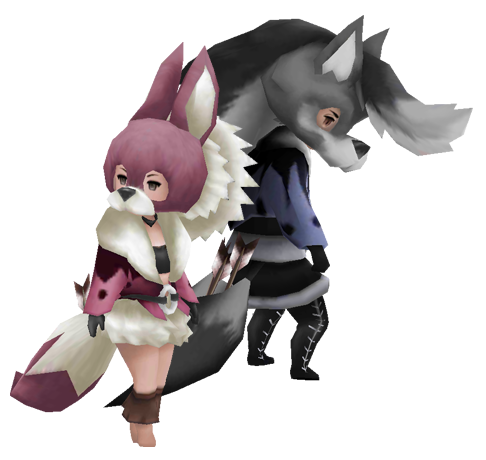 This costume would be great if they were hunting for a yiffing partner at a furry convention. As if the comically oversized and obvious wolf masks weren’t enough to land them in the Hall of Shame (they are), these costumes make zero sense otherwise. Why does the gent have a second tail acting as some kind of wolf mohawk? Why is the lady both dressed as a wolf but also wearing a decadent, decorative fur coat? What’s with the gent’s skeleton-stitch pantyhose and the set of arrows sticking out of their tails? We can only imagine that they tried to commit wolf seppuku upon seeing themselves in a mirror, but ended up like their outfits: failures.